This section of our web site contains information on products related to our refractory products, such as casting and quick setting cements, moulding sands and other related items. Read the table below for more information. Cement Fondu is a hydraulic binder based on calcium aluminates, allowing rapid setting and exceptional corrosion resitance. Dincast high temperature castable using high alumina cement for use up to 1400°, ideal for reheat furnace walls and roofs, burner blocks and others. Dinset cement gives outstanding service in all types of boilers, ceramic kilns, rotary kilns, ladles, flues, stacks and industrial furnaces. Perlite is a naturally occurring volcanic glass ideal for use a s a slag coagulant and other refractory uses. Petrobond is a ready to use sand designed to facilate the production of high quality aluminium, zinc and cupro-alloy castings. Vermiculite is the fibre-free natural insulating material that is completely safe and completely non-irritant. 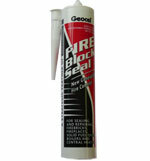 Geocel® Fire Block Seal, is a ready mixed and ready to use new generation fire cement that will withstand temperatures up to 1500°C.